A woman has denied causing a major fire at Nottingham railway station. Ten fire crews were needed to bring the blaze under control after it broke out on 12 January last year. Gemma Peat, 34, of Wilford Crescent East in Nottingham, pleaded not guilty at Nottingham Crown Court to two counts of arson. 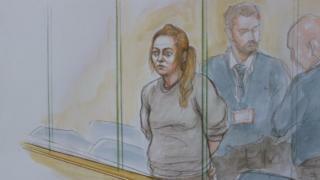 She was remanded into custody and is due to stand trial on 12 August. A court previously heard the fire caused £5.5m worth of damage at the station. Ms Peat denied arson with intent to endanger life and a charge of arson being reckless as to whether life is endangered. The station had to close and trains, trams and buses across the city were cancelled or disrupted for much of the day after the fire, which broke out in the women's toilets.